We at Partners in Craft are admittedly thrift store addicts. Give us any minimal excuse to stop by our favorite shops, and we are there. 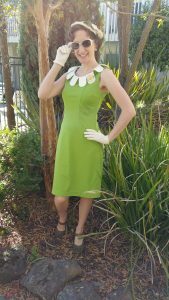 However, Lindee and I have discovered that October is the best time out of the whole year to find vintage and vintage-inspired clothing! Many thrift stores save up costume items for Halloween season, making this the best time to hunt for old timey looks. Of course, we advise that once you find an item that fits well, is in good condition, and makes your day, you should probably buy it. Do not worry if you don’t have an entire outfit to go with it. These things will come. 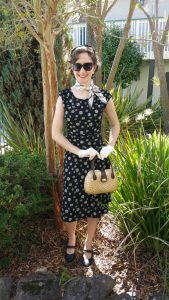 My two vintage-inspired outfits are great examples of both the shop-vintage-in-October and the buy-it-when-you-find-it principles. Both dresses and the black/white scarf were bought near Halloween. The accessories were found over time. 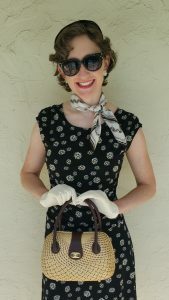 The only items that did not come to me via the thrift store are the white hat and gloves from the fabulous Stormie, the sunglasses, and the daisy pin from my fabulous grandmother! The dress, surprisingly, is not vintage but a very convincing remake! 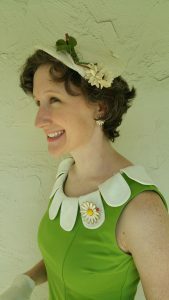 My next outfit also features a not-actually-vintage dress. All of the pieces, except my dark glasses and gloves, came from, you guessed it! Vintage looks a la thrift store! 🙂 Happy shopping!